At the same time, political and economic changes are sweeping the entire region. Until ten years ago, the Kingdom of Lo was part of Nepal, a parliamentary monarchy. Then Nepal’s parliament declared the country a republic and the Kingdom of Lo became the Mustang District. In addition, China is building infrastructure in Tibet, which borders Mustang and has long shaped culture there. Construction crews are replacing the well-worn paths of pilgrims and pack animals with paved roads. In response, subsistence grain farmers have planted more cash crops, such as apples, for sale outside the region. Others are building guesthouses for the ever-more globalised trekking pilgrimage to the massive peaks of Annapurna. Meanwhile, the dark blue sky over this high plateau delivers less and less snow. The changes have caused residents of Dhagarjung and Phalyak, communities in Mustang that have shared a watershed for centuries without major incident, to argue over water rights. Now residents of Dhagarjung and Phalyak and Nepali and foreign researchers are putting to the test new ideas and new technology that may help isolated, small communities improve their own environmental science and governance. Data the community has collected so far are promising, says Santosh Regmi, chairman and researcher at Nepal Hydrological and Meteorological Research Center, who was involved in setting up the project: “If we properly manage the water, then it can irrigate all their agricultural land.” The process of including the local community in the water monitoring and management offers lessons for other places. 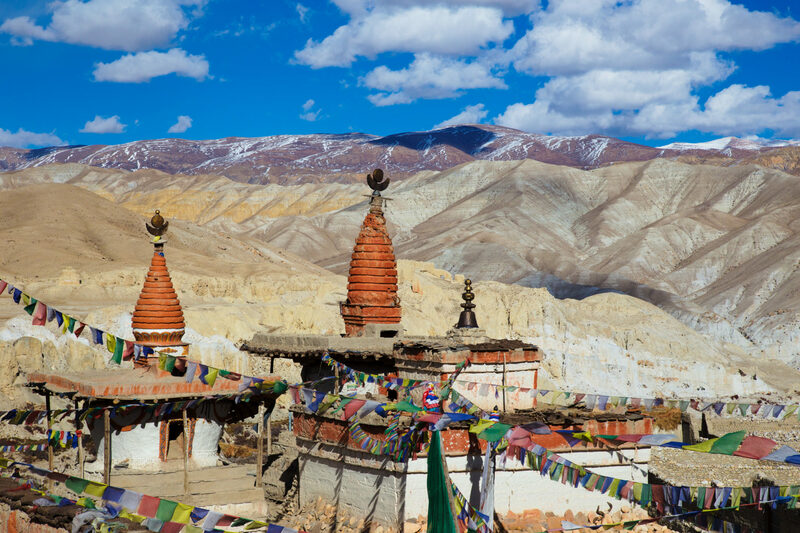 Mustang gets less than 20 cm of rain a year, and its economy has always depended on resources beyond its mountain borders, such as trading salt and wool from the Tibetan Plateau for food from the more fertile valleys in the Indian subcontinent. But such trade crept at the pace of pack animals until the recent and still limited arrival of paved roads. 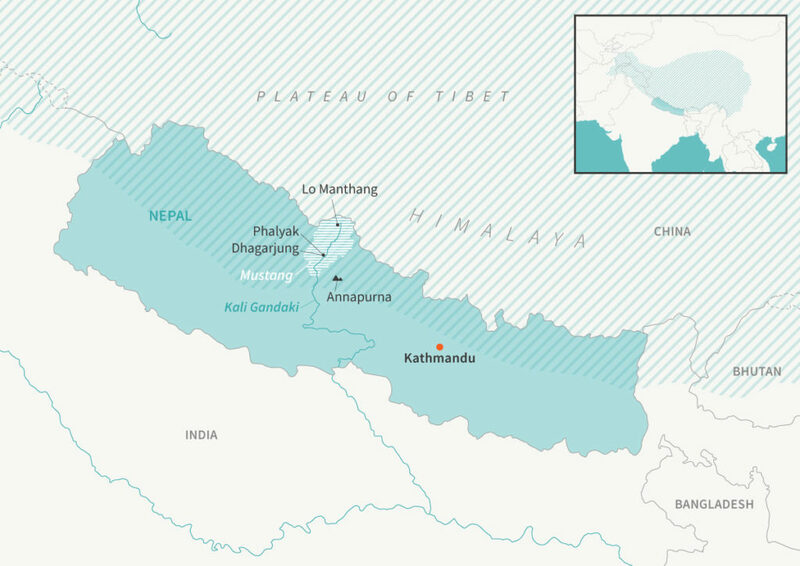 Political unrest in Tibet and later China has restricted border crossings for decades. Residents therefore supplemented trade, forestry, and other sources of income with barley, wheat, and buckwheat grown on grassy terraces alongside the Kali Gandaki and other river valleys. In the absence of rain, natural reservoirs in the form of deep snowpack and year-round glaciers enabled agriculture in the region. The snow took months to melt and provide a more or less predictable trickle during rainless periods. In Dhakarjong and Phalyak tradition, households sent representatives to a local irrigation committee called a mukhiya to plan where to direct the flow using wooden weirs. Through such self-organisation the community was able to ensure that lack of water didn’t hold back agriculture. A map of Nepal, showing Mustang in white hash marks, and the Tibetan plateau in blue hash marks. Illustration: E. Wikander/Azote. 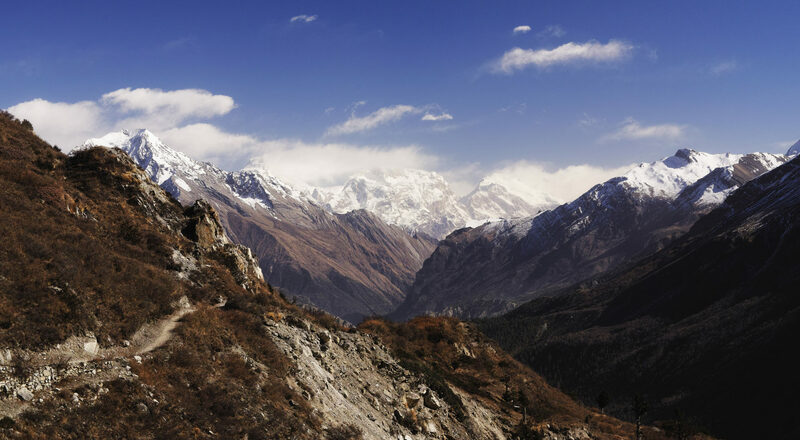 The residents of Dhakarjong and Phalyak share their dependency on snow with 1.3 billion other people in ten river basins that drain the world’s highest mountain range, the Himalaya. And for reasons climatologists are only beginning to understand, extreme places such as these mountain slopes, and the planet’s poles, seem to be responding the fastest to human-induced climate change. Himalayan temperatures have risen faster than the global mean in the last few decades. This threatens to disrupt the region’s hydrology, and with it, its ways of life. Residents of Mustang have told researchers that they see less snow overall, and more variable snow and rain. That puts the community’s crops at risk and worries them: “One of the stresses that we identified very early on was the stress around water security,” says independent researcher and former postdoc of Wageningen University Timos Karpouzoglou, who collaborated with Regmi and others on the Mountain EVO project. From 2014 to 2017 the project organised a mixture of environmental monitoring and community mobilisation in Mustang and other mountain regions. The idea was that monitoring the water flow could help the community better plan their irrigation year to year and improve their agriculture and food security. In rich parts of the world, such as California, water managers track the fall and flow of snow, rain, and river water in comprehensive detail from ground sensors, ski surveys, and even from the air. Developing regions can tap into some global water monitoring resources and their national governments often gather some rainfall or river flow information, but the data and forecasts may not reach the level of detail needed by farmers. There’s another problem, too: in Mustang, “local people don’t really have access to those data,” says hydrologist Wouter Buytaert of Imperial College, London, in the United Kingdom. But hardware costs have been dropping, and Buytaert and other members of the Mountain EVO collaboration began offering mountain communities cheap rainfall collectors and river flow sensors. “We had been working in the Andes a long time on participatory monitoring of streamflows to alleviate the data scarcity,” Buytaert says. And while they cooperated with national agencies, they designed their project to share data with municipal authorities and local water decision makers. Starting in 2014, Regmi and other Nepali hydrologists and social scientists joined the international Mountain EVO team in visiting Dhakarjong, Phalyak and neighbouring communities. The two communities share the 1,500-hectare watershed of Lhumbuk stream. In recent memory, irrigation was not the limiting factor: in fact, residents had let an irrigation canal degrade because it cost too much work to maintain. But now that snow on lower slopes no longer irrigates some fields, residents of Dhakarjong have started claiming that they needed more of the Lhumbuk stream’s water. The existing method for dividing the water was to divert it to Dhakarjong for two of every five days and to Phalyak the other three days. “Historically it’s quite well designed,” through trial and error, says Buytaert. But with climate change, the range of maximum and minimum rainfall also changes and now “that kind of adaptation is much more difficult to do”. After interviews with residents, the Mountain EVO team began working with them to select sites for monitoring water flow and to create an annual model of the watershed’s hydrology. The local data they collected could inform local water management. Including the community in designing the data collection and deciding what to do with it later was an important choice, says Catherine Tucker, an anthropologist of mountain communities at the University of Florida in Gainesville. “It’s been really clear that when the communities themselves learn techniques for assessing things like their harvesting rates or precipitation events… they can use it in novel ways that wouldn’t have occurred to the scientists and then that also carries the knowledge forward. It becomes part of the knowledge of the community,” she says. “In wintertime, due to snowfall, people do not need more water for irrigation and the water in the streamflow is wasted,” Regmi says, “but in the summertime when they need more water, the available water does not meet demand… so there is some kind of imbalance.” The community told Regmi and the Mountain EVO team their problems, and together they agreed on where to measure water levels so that they could create a year-round model of the Lhumbuk stream. After one year of collecting data, Regmi and the Mountain EVO team did their calculations and organised meetings with the local community. While one year is not enough to make longer-term projections that account for climate change, it does give the community a snapshot of the annual water availability in the stream. The team shared the information using visualisations on posters and discussed their findings in person in order to reach illiterate members of the community. The meetings also alerted residents to the fact that their national government in Kathmandu already has some weather and river flow data. “By being more aware about the value of those data they started putting more pressure on the local representatives of the governments,” Buytaert says, to take up their cause with officials in Kathmandu and ask for better access to national forecast data for use in local agriculture. It is too soon to know whether the community will be better off for quantifying its water supply, but their expectations are already changing. “Local people are not able to manage physical infrastructure, for example construction of irrigation canals in concrete and ponds to store surplus water, but they can at least go to the government offices and ask for it by showing the research output,” Regmi says. And discussions, ahead of data, have already initiated some smaller physical reforms to the irrigation system, Buytaert says. “That was a side effect we hadn’t expected: bringing discussion of water and water availability”. In these discussions people realised that they were losing a lot of water. Even before the initial monitoring project was done, locals increased the width of their earth canal, and did some work to minimise leakage. That was one example of how farmers in mountain environments do not always need to wait around for action from the national level. First published by Rethink: [html] [pdf]. This text is licensed under a Creative Commons Attribution-NonCommercial-NoDerivatives 4.0 International License but the images are copyright as indicated in the captions.